The Dodger Stadium Express Bus takes you to the Stadium. The stadium also offers behind-the scenes-tours. Check website for more information. What can we say, they're the Dodgers. The team that integrated baseball, that broke Brooklyn's heart and brought the forever young voice of Vin Scully to L.A. The team of Roy Campanella, Maury Wills, Sandy Koufax and Fernando; Kirk Gibson's fist pump, Steve Finley's bottom of the 9th grand slam against the Giants, Andre Ethier's 30 game hitting streak; and of course peanut vendor Roger Owens, pitching peanut bags to hungry fans with beneath-the-leg, behind-the-back panache for over 45 years. 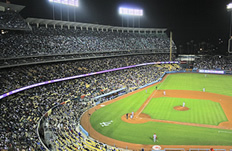 (Yes, this unsung hero of Dodger Stadium baseball has a website). Now that Magic Johnson's investment group owns the Dodgers, the messy divorce phase is in the past, and we fans can go back to Dodger dogs, roasted peanuts and praying for the pennant that has eluded us for decades. Getting there with the Dodger Stadium Express shuttle bus: Board the bus from Bay 3 of the Patsouras Transit Plaza at Union Station. The Patsouras Transit Plaza is behind the station.